DIoTY provides you with a stable infrastructure to build your IoT projects. Based on MQTT, an M2M/IoT connectivity protocol standardised by OASIS MQTT TC. Use the DIoTY mobile app to interact with your things. Easy to configure mobile app ready to use on both Android and iOS. Display sensor data, toggle switches or use sliders from your phone or tablet. With sample code to get you started. Connect your IoT devices to DIoTY's cloud service using MQTT, an industry standard lightweight communication protocol for the Internet of Things. Sample code for Arduino Sketch, Python (Raspberry PI), node.js now included with links to sample code for Java and C#. Build your own Internet of Things. Use the open standard MQTT to connect sensors, actuators, mobile apps, etc... Find sample code on our site or search the net for one of the many example projects and use DIoTY as your Cloud MQTT Service. Use the DIoTY mobile app to interact with your things. Easy to configure mobile app ready to use. 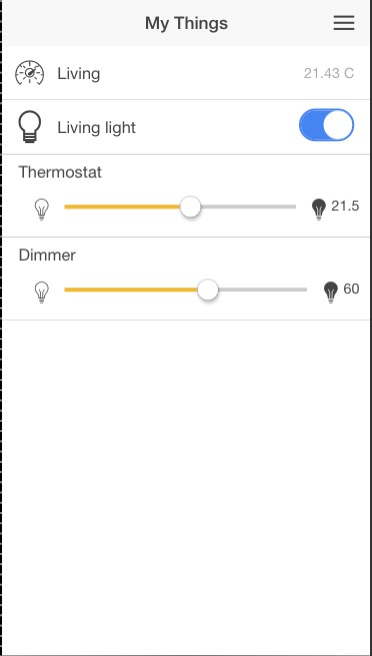 Display sensor data, toggle switches or use sliders from your Android or iOS. The Internet of Things at hand on your mobile or tablet!